Austin Monthly Magazine kicked off 2016 with an admittedly macabrely-titled list of 36 Things You Must Do In Austin Before You Die. Among all the breakfast tacos and swimming holes stood one 251 foot tall landmark: our iconic COTA Observation Tower. "You don’t have to wait for Formula One in October to enjoy Circuit of The Americas," said Austin Monthly. "COTA offers guided tours with stops at all of the Circuit’s sites, including the 25-story observation tower, which grants visitors stellar views. Public tours are available most Saturdays and Sundays, and while the experience may not satisfy your need for speed, it’s easier to enjoy the view when you’re not racing around the track at 200 mph." Whether you're enjoying a day of racing or just visiting for the weekend, a trip up the Tower is one of the best (and most exhilarating) activities Austin has to offer. 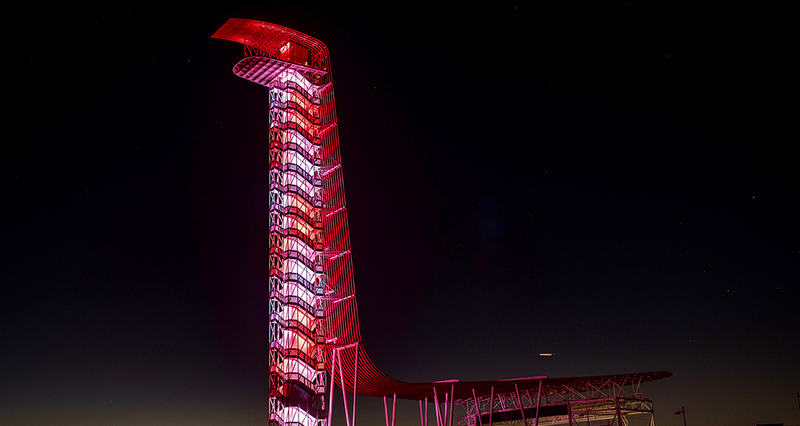 The Tower will be open to the public on race weekends and through COTA tours.